The Gateway Arch, or as it is more commonly referred to by most Americans, the St. Louis Arch, is one of the most recognizable American monuments. The structure, which is the tallest man-made monument in the United States, sits in St. Louis, Missouri, as the most visible part of the Jefferson National Expansion Memorial. The large structure, which was designed in 1947 and constructed from 1963 to 1965, has each of its legs embedded in 23,570 tons of concrete, which are 60 feet deep and 44 feet thick. Roughly two and a half years of construction brought the arch project cost to around $13 million dollars, which today would equal somewhere close to $95 million dollars. 50 companies received bidding invitations for the arch and visitor center located at the Mississippi River’s west bank. Ground for the project was broken in ’59, and two years later the foundation of the large structure was laid. Work on the arch itself did not begin until February 1963. The arch, which consists in large part of steel and concrete, has 142 12 feet long prefab stainless steel sections, which subsequently to assembly where filled in with concrete. Due to the project timeline running longer than expected, the dedication ceremony date for the 630 feet high and wide reinforced concrete arch was re-set several times, until it was officially dedicated by Vice President Humphrey in May of 1968. Original estimates projected that the construction project would produce 5,000 jobs. Though this number is said to be a far cry from the actual numbers, the Gateway Arch construction project did spur riverfront restoration and construction efforts, leading to a sports stadium, a motel, a hotel, several garages and an apartment complex for the city of St. Louis. The arch was meant as a monument to honor Thomas Jefferson and pioneers. 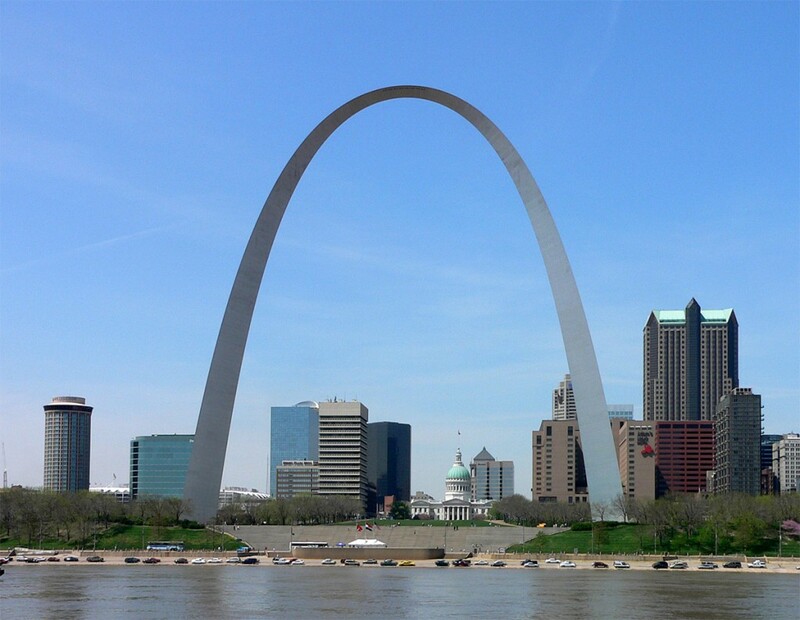 The name Gateway Arch is an extension of the city of St. Louis being the “gateway” to the American West. At its peak, the arch is 63 stories high. There are 142 steel sections in the arch. The arch is constructed of reinforced concrete. All the steel for the construction project was supplied by the Pittsburgh-DesMoines Steel Company. The arch’s structure can withstand an earthquake and sways in very strong winds.